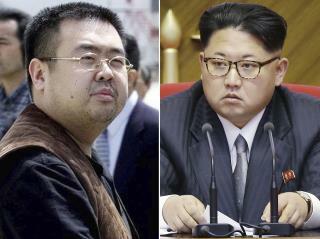 (Newser) – The US has imposed additional sanctions on North Korea after determining the country used chemical weapons to assassinate Kim Jong Un's estranged half brother in Malaysia last year, Reuters reports. Kim Jong Nam died after two women smeared his face with the banned nerve agent VX in the Kuala Lumpur airport; they say they thought they were pranking him for a TV show. North Korea denies involvement. It seems that Kim got all the looks in that family. The stupid North Koreans said they want to halt their missile launching and hold “talks.” Wonder what they want in return. As long as Fatboy is in power, the people will still be miserable. I like the part best where the two women said they were doing a prank for a TV show. Today, everyone grabs their cell phone to record an accident in lieu of 911. People feel they truly can have their time in the sun with fame.